Anne Acker is very happy to say she is a full time Historic Keyboard Specialist. Obsessed with pianos from an early age, yet dissatisfied with trying to find something in the baroque, classical, and romantic era music that the modern piano was not supplying, she trained as a concert pianist, but then went on to gather degrees in mathematics and computer science. She was a National Science Foundation and Bell Laboratories Fellow at Stanford University for her doctoral research. The piano, and soon the harpsichord, kept calling though, and it was a happy day when she gave up such work as designing operating systems for supercomputers and doing theoretical work on the implications of null values in databases, and decided to concentrate on her passion. This meant working from home while she raised her children, and making music, preferably in ensembles, searching out instruments, plus teaching all ages about keyboard instruments, and gradually building and repairing harpsichords and pianos from all periods of history. Her children learned to share the playroom with harpsichords and antique pianos under repair and construction, though they laid down the law about letting the overflow of instruments creep into their bedrooms. They also became excellent harpsichord carriers, string loop holders, page turners, aesthetic critics, and in general, wonderfully supportive of their mom. Over the years she has played modern or early piano or harpsichord with many instrumentalists and singers, played in chamber music ensembles including the Galliano Trio in Miami and as accompanist for several professional choirs, among them the Wisconsin Children’s Choir, the Miami Children’s Choir, and most recently the Savannah Children’s Choir. In addition, she has served as harpsichordist for the Eclipse Chamber Orchestra in Washington, D.C. and as continuo harpsichordist and chamber organist for the Miami Bach Society Orchestra. Recently she has given a lecture recital at the Savannah Music Festival 2007 on Keyboard Music of Georgian Georgia, performed many concerts with local Savannah organizations, including as featured harpsichord soloist for Bach’s Brandenburg V with the Savannah Sinfonietta. Anne’s recording of 19th century songs, Voices That Are Gone with tenor Richard Turner, is sold in historic houses and at the Smithsonian Museum of American History. 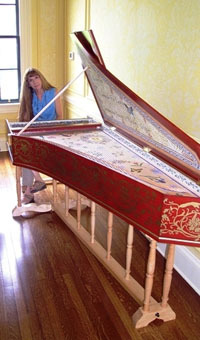 She professionally builds, restores and decorates harpsichords, clavichords, and fortepianos, and is the east coast U.S. representative for The Paris Workshop kits out of Paris, France. In addition, she is a world-recognized expert on the restoration, history and values of 19th century pianos. Anne has been gradually creating her own selective collection of historic keyboard instruments and has merged the ‘piano’ part of her operations with PianoGrands. Most recently, she is engaged in research into the micro level behavior of harpsichord and antique piano actions, as well as research into the properties of 18th and 19th century instrument building fabrics, leather, and wire.